PHOTO BY STEVE WILLIAMS Seneca East’s Tyler Turek watches a double during Thursday’s Division IV postseason game against Ridgemont in Attica. 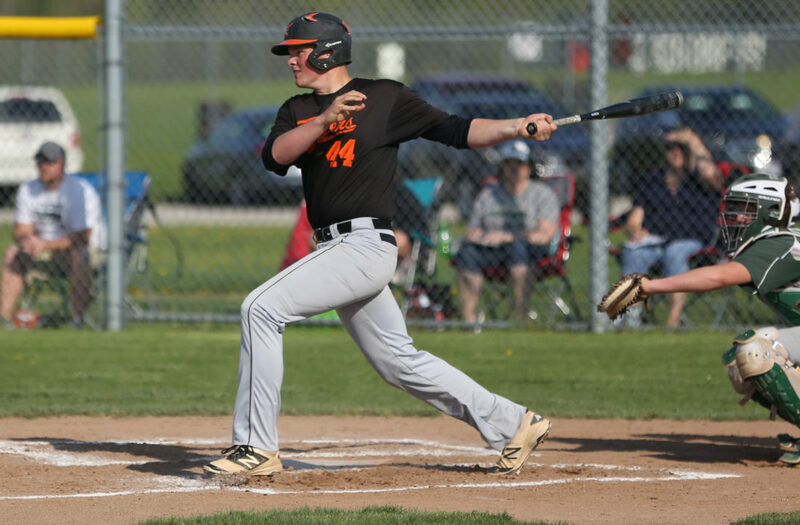 ATTICA — Bo Smith was cruising on the mound and Seneca East led 4-0 after two innings, before the Tigers unleashed a 13-run third inning to blow the game open Thursday in an 18-2 Division IV district quarterfinal victory over Ridgemont. The Tigers compiled 15 hits as Kainon Ruffing (3 RBIs), Rickie Lacy (2 2B, 2 RBIs), Tyler Turek (3B, 2B, 2 RBIs), Hunter Martin (3 RBIs) and Chase Foos (3 RBIs) all had two hits. Kyle Siesel added a double and an RBI, while Brandon Best, Jake Hall and Smith all singled and drove in a run. Spencer Walker doubled. Smith pitched four innings not allowing a run, while giving up two hits and fanning nine. Martin pitched the fifth frame, giving up two runs on a hit. The Tigers (17-3) will face Plymouth at 2 p.m. Wednesday at Galion. SANDUSKY — Calvert started well, but didn’t finish that way Thursday. The Senecas raced out to a 7-1 lead after 2 ½ innings in a Division IV district quarterfinal against Sandusky St. Mary. But the Panthers stormed back to plate three runs in the third and fourth innings before adding two more in the fifth to win 9-7. St. Mary had 15 hits as JJ Fischer hit three singles and drove in a run, while Vinny Will (3 RBIs), David Baird, Everett Samstag (RBI), Anderson Gennari and Kyle Pelz (RBI) all had two singles. Mikael Dunn singled and drove in three runs for the Panthers. For Calvert, Trenton Cooper hit three singles and drove in a run, Nolan Wuescher (RBI) and Josh Gase (double) each had two hits and Connor Kennedy and Devin Borer both singled and drove in a run. Samstag got the win on the mound in 4 2/3 innings of relief, allowing no runs on four hits. Josh Gase was the losing pitcher, giving up five unearned runs on six hits in an inning of relief. CAREY — Carey took control early Thursday in a 12-2 Division IV district quarterfinal win against Upper Scioto Valley. The Blue Devils (21-1) scored three runs in the first and seven in the second en route to advancing to Wednesday’s semifinals at Marathon Diamonds in Findlay against Riverdale. Trey Bame (10-0) got Thursday’s win, fanning 13 and scattering eight hits and one earned run. He also shined at the plate, going 4 for 4 with three RBIs, two runs and three doubles. Brayden Wentling added two doubles and two runs, Reese Mullholand doubled, scored and knocked in a run and No. 9 hitter Jordan Dasher went 3 for 3 with two runs, three RBIs and an inside-the-park homer. Easton Roark added two singles, two runs and two RBIs, Grant Frederick singled and scored, Caden Owens had a run and RBI, Marcus Miller scored and Dyland Grothaus knocked in a run. BASCOM — Hopewell-Loudon fell behind Toledo Christian 3-1 Thursday after five innings. However, after a three-run sixth, the Chieftains took the lead. The Eagles tied things up with a run in the top of the seventh, but Jaret Nelson hit an RBI single in the bottom half of the inning to help the Chieftains escape with a 5-4 Division IV district quarterfinal win. The Chieftains will play Ottawa Hills at Clyde at 2 p.m. Wednesday. Nelson drove in a pair of runs on the day, while Zach Kreais tripled, Cody Balliet doubled and Travis Milligan and Bailey Breidenbach each hit a single and drove in a run. Kreais went the distance on the hill, giving up four runs on nine hits. He fanned eight and walked two. SYCAMORE — Bryce Kirian and Kedryk Leeth each lined key run-scoring doubles Thursday to fuel Mohawk’s 10-4 Division IV district quarterfinal win against Plymouth. Kirian’s RBI double highlighted a five-run second inning for the Warriors (11-11), and Leeth doubled in two more in a four-run fourth to extend the lead to 9-4. Mohawk advances to Wednesday’s 4 p.m. semifinals at Galion. Kirian finished with two doubles and three runs, while Leeth added a single and a run. Winning pitcher Cole Widmer doubled in a run and singled, Tyler Hayman scored twice and singled in a run, Landen Snyder had two RBIs, a single and run, Rico Lopez singled and scored, Parker Brown had a run and RBI and Kurtus Ekleberry scored. TOLEDO — Ottawa Hills came ready to play in a Division IV district quarterfinal Thursday against Old Fort, leading 8-0 through three frames. Old Fort made a comeback, but it fell short, 9-6. The Stockaders scored a single run in the fourth, two in the sixth and tacked on three more in the seventh to make things somewhat interesting. Jacob Webb doubled, singled and drove in a pair of runs for Old Fort, while Kaleb Wilkinson and Luke Wagner both had a pair of singles. Zach Kohlenberg ended with a single and an RBI. Wilkinson took the loss, allowing nine runs (four earned) on eight hits with eight strikeouts and a walk in four innings. PLYMOUTH — Plymouth beat Buckeye Central 7-2 Thursday to oust the Bucks from the Division IV district tournament. Josh Dentinger took the loss for Buckeye Central (9-16). He struck out nine. Brady Kerschner hit a two-run homer in the fourth for Buckeye Central. Kyle Sanderson singled and scored, Dentinger singled twice and Joe Cole and Tommy Phillips each singled. McCOMB — McComb recorded two four-run innings Thursday against New Riegel in a Division IV district quarterfinal, but the most important run was in the sixth. New Riegel tied the game at 8 with two runs in the top of the sixth, but that insurance run for the Panthers ended the Blue Jackets’ tournament run with a 9-8 win. Both teams had 10 hits as Cole Noftz tripled, singled twice and drove in a pair of runs for the Blue Jackets. Nick Reinhart tacked on two singles and three RBIs, while Alec Zoeller doubled and drove in a run, Darek Feindel lined a pair of singles and Ben Dryfuse and Jacob Theis both singled and drove in a run. Zoeller was the losing pitcher, giving up nine runs (six earned) on nine hits, while striking out 11 and walking three in five innings. Noftz also pitched a scoreless inning.